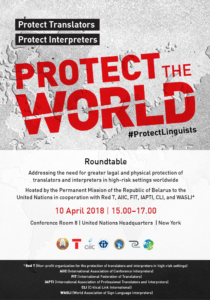 The Permanent Mission of Belarus to the United Nations organized a roundtable in cooperation with Red T, AIIC, FIT, IAPTI, CLI and WASLI to address the need for greater legal and physical protection for translators and interpreters in situations of armed conflict and post-conflict peace-building. We are grateful to Ambassador Valentin Rybakov and Deputy Foreign Minister Andrei Dapkiunas for hosting this event and providing a forum for participants to raise awareness among UN member states, explore the root causes, provide information on existing protection mechanisms, and discuss future actions to enhance such protection. Minister Dapkiunas introduced the topic and laid the groundwork for the other speakers, among them, Dr. Maya Hess from Red T, who outlined the current landscape and elaborated on potential international legal instruments; Linda Fitchett, chair of the AIIC Conflict Zone Interpreter Project, who offered case histories and casualty statistics; FIT president Kevin Quirk, who delved into the complexities of working for defense contractors; IAPTI representative Heidi Cazes and WASLI representative Bill Moody, who presented their organizations’ perspectives; Betsy Fisher, a lawyer and policy director of the International Refugee Assistance Project, who briefed the audience on IRAP’s work and suggested steps for mitigating risks and vulnerabilities; and Dr. Sara de Jong, a political scientist from the Open University in the United Kingdom, who shared findings from her research, such as the lack of an internationally coordinated protection and resettlement program. We also would like to thank Lúgh Studio for providing the event graphic.